As its' name suggests, Villa Skala Beachview has magnificent views over the neighbouring countryside to the open sea. This 3 bedroom property has its own private pool, fabulous terrace area and bright and airy interiors. 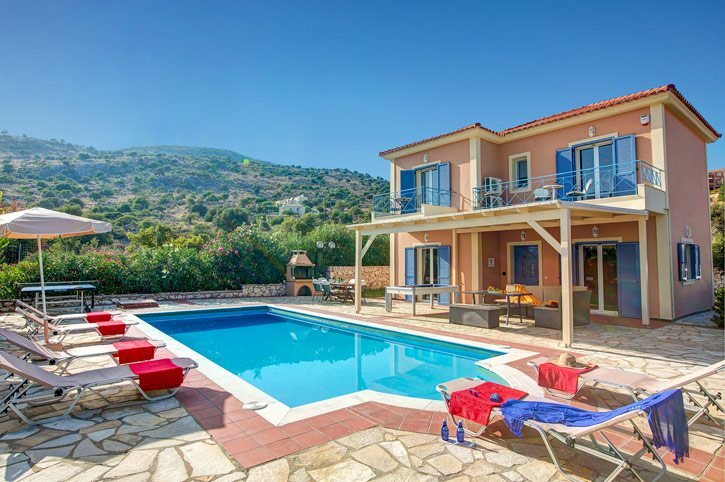 The beach and facilities of Skala all within a 10 minute drive, making Villa Skala Beachview an excellent choice for your Kefalonia villa holiday! Air conditioning/heating in the bedrooms and lounge, pool heating and WiFi are included. The views over the beach to the sea are just fabulous! The inviting private swimming pool has ample space to relax and soak up the sun before a much needed dip to cool off! There is also a covered dining area and a brick BBQ for enjoying a traditional Greek meal. The terrace is bordered with trees and shrubs for a good deal of privacy. Set back slightly from the road, a short track leads to the electric gated entrance of the Skala Village Villas - Skala Beachview, Skala Bayview, Olympia Skala and Ionian Ocean. Villa Skala Beachview has off-road parking for your hire car, with a short path leading round to the front door. The kitchen, dining area and lounge are open plan in style, creating a large and sociable space. There is ample seating, a flat screen TV and a dining table with chairs, plus the kitchen is fully equipped for your holiday meals. Natural light streams in through the patio doors which lead out to the pool terrace. On the ground floor is a spacious double bedroom with an en suite shower room and patio doors leading out to the pool terrace. There is also a separate WC on this level. Upstairs is a second double bedroom with an en suite bathroom and patio doors that lead out on to a balcony where you can sit and enjoy the sea views with your morning coffee. The twin bedroom also has a balcony with the same spectacular view and en suite shower room. This villa is registered and licenced by EOT Greek licensing association. This number is: 0830K10000833501. Situated an easy 10 minute drive from Skala Village and the beach, Villa Skala Beachview is one of a small community of 4 villas - Skala Beachview, Skala Bayview, Ionian Ocean and Olympia Skala. Skala is known for its 2 mile long sand and shingle beach with its back drop of pine trees. Skala Village is within easy reach by car and has good facilities as well as a number of shops and tavernas to enjoy. Skala Village is designed in a grid pattern making it very easy to find your way around. Facilities include several mini markets, a bakery, chemist and ATM's. There are also a few small gift shops, great for picking up some souvenirs to take home. Skala is home to a large selection of bars and tavernas, serving traditional Greek cuisine as well as some international menus sure to suit all tastebuds! Also close by is the small seaside village of Katelios. Originally a fishing village, Katelios has a number of tavernas offering fresh fish dishes. The main focus of Skala is its long beach where a large variety of water sports are available and also a glass bottom boat which runs day trips to Ithaca, Fiskardo and Zante. Kaminia Beach, further along the coast, is the nesting place for the caretta turtle. Volunteers patrol the beach during the summer months to mark and protect the nests. This is a beautiful long stretch of sand with shallow water, making it ideal for children. Hiring a boat is a great family day out and an ideal way to explore the stunning coastline. Why not pack a picnic and become a skipper for the day? The old village of Skala was destroyed in the 1953 earthquake and rebuilt closer to the sea. The ruins of the original farming village which are up in the hills above the main street are popular with walkers. Not far from the main street and close to the sea are the remains of a Roman Villa. The mosaic floors are protected by glass and can be viewed via a walkway. Villa Skala Beachview is not available to book for season as it is sold out. Take a look here at the Kefalonia villas that are currently on sale. Beautiful sea view villa. Although in a complex with another 3 villas, we felt privacy was maintained throughout our stay and would definitely go back to Kefalonia. Beautiful villa, everything was excellent. Excellent friendly cleaner. She's a real asset and would encourage us to book the same villa again. It was a very enjoyable holiday, the maid was very nice, helpful and a pleasure to meet, the rep visited us and was also very nice. Would definitely use your company again. Beach view and villa grounds were amazing.